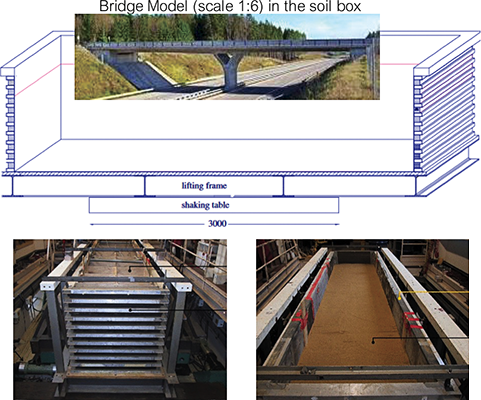 The object of this proposal is to investigate seismic soil-structure interaction effects in complex structures involving Integral Abutment Bridges (IAB’s), develop numerical and analytical solutions, for different configurations, while checking a number of innovative technological solutions, and produce provisional design guidelines. 2) piles disconnected from the footing, yet restricted from sliding through shear keys. Both single pile row and two-pile rows will be considered. The bridge is a two equal-span structure, supported on a single pier. Under the foundation of the abutment gravel will be employed. The abutment backfill will consist of gravel or shredded tyre-sand mixtures. The underlying soil will be modelled using densely compacted granular material to avoid dynamic compaction during shacking. Installation of: (1) a vertical layer of EPS geofoam between the backfill and the abutment wall, and (2) an annular zone of EPS geofoam around the upper portion of the piles, will be considered to reduce horizontal stresses. In real life applications, a drainage system and an envelope of geomembrane are employed to protect EPS from floatation and contact with oil substances. Seismic excitation will consist of real earthquake records selected from the European Data Base under pertinent criteria for performance based design of bridges. Possible reference sites will be associated with high hazard zones in Italy (e.g. L’Aquila), Greece (e.g. Gulf of Corinth), or Turkey (e.g. Duzce). Instrumentation measurements will include multi-axial accelerations, displacements using LVDT’s, strains using classical gauges and modern fiber optic devices, pressures using pertinent cells. In addition, state-of-the-art Digital Image Correlation (DIC) techniques using high speed cameras will be employed for a better understanding of associated SSI effects. The Co-I’s are aware that testing associated with response of integral abutments to thermal loads is ongoing at UoB under the auspices of a UKCRIC pump priming project funded by the British government (PI-Colin Taylor). Please note that Co-I Bruno Briseghella is currently PI in a number of related projects in China (University of Fuzhou). The current project will benefit from the expertise on SSI and integral bridges gained from the above efforts. It is worth mentioning that the control system of the shaking table at UoB incorporates a hybrid testing capability that allows parts of the model to be tested in other Labs, in real time. The possibility of conducting a relevant hybrid test, using a single abutment, although not essential as part of the current project, has not been excluded and will be considered as part of the collaboration with other labs, such as that in Fuzhou China and Roma Tre, using different funding after completion of the proposed project. These may allow obtaining data at larger scales. High capacity computing, available in UoB, will allow processing large amount of data on soil and structural components. The tests will be carried out at different intensity levels to identify relevant effectsand will be accompanied by numerical analyses using OpenSees and FLAC.